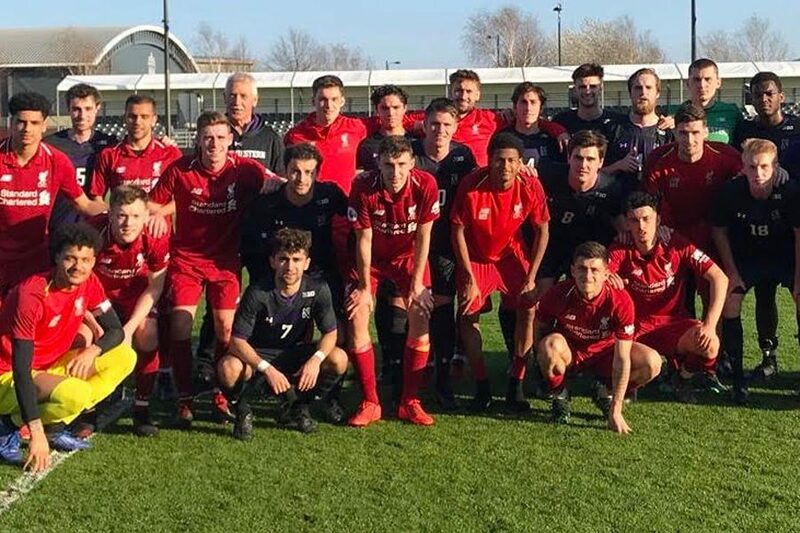 Northwestern poses with the Liverpool U-23 team. The Cats traveled to Spain and England over spring break, playing some of the top youth teams in Europe. For the past few seasons, Northwestern has had a set play called “Raúl.” It’s named for the mononymous international soccer icon, a striker who played 16 seasons for global superpower Real Madrid and is widely considered to be one of the greatest Spanish players of all time. Two weeks ago, the Wildcats took advantage of an opportunity of a lifetime: At Real Madrid’s training facility, just fifty yards away from where some of the world’s greatest footballers practice, they ran the play against its namesake. NU played a pair of friendlies — the first against the Real Madrid academy team, coached by none other than Raúl, and the second against English club Liverpool’s U-23 side — across the Atlantic over spring break. Coach Tim Lenahan called the program’s experience facing this level of European competition the first of its kind in college soccer history. Lenahan said he’d been planning a trip like this for around five years before it actually came about. The plan finally came into focus when Santiago Solari, a Champions League-winning midfielder who played for Lenahan at Stockton University in 1994, was named Real Madrid’s interim manager in October. Solari served as Real Madrid’s manager for five months before he was replaced by Zinedine Zidane. The Liverpool connection arose from Michael Gordon, the president of Fenway Sports Group — the group that owns Liverpool FC — and the father of Emmett Gordon, a midfielder for NU from 2015 to 2018. The Cats drew 2-2 against Real Madrid on March 26 in Madrid in their opening match, facing a squad that held possession for most of the afternoon. Senior Mac Mazzola and sophomore Jose del Valle — himself a product of the Real Madrid academy — scored NU’s two goals on the counter. In England three days later, the Cats fell 4-0 in a match to a talented Liverpool side that featured hotshot striker Rhian Brewster, one of the sport’s most highly-touted young players who led England to the U-17 World Cup two years ago. In addition to playing the matches, the team toured the Estadio Santiago Bernabéu and the Palacio Real in Madrid. While in England, the Cats visited Anfield, Liverpool’s home stadium; the Etihad Stadium, home to defending Premier League champions Manchester City; and attended a league match between Manchester United and Watford at Old Trafford. The confidence that came from holding their own against some of the best youth teams in the world will carry over for the Cats the rest of this spring and heading into the fall, senior midfielder Mattias Tomasino said. Around ten days after their match against Liverpool, the Cats beat DePaul 2-0 in the first round of this spring’s Chicago Cup.